Matrix T7xe Treadmill is an ultimate treadmill machine fully equipped with modern technologies and accessories to make you workout even better without making you feel bored and tired. 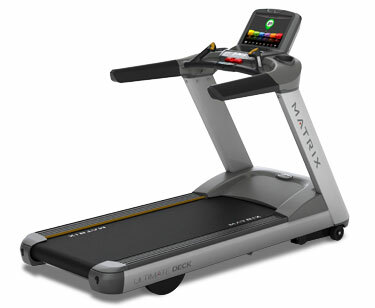 Matrix T7xe Treadmill comes with Ultimate Deck System offers over 25,000 miles of maintenance-free performance. Dynamic Response Drive System is coupled with controller technology that continuously monitors and adjusts to user foot fall to ensure a perfect stride .Vista Clear Television Technology delivers the most crisp and vibrant digital display available Cast Aluminum End Caps- For lasting durability, the Matrix 5 and 7 series treadmills are equipped with cast aluminum end caps. ToughTrain 3.5 out of 5 A tough treadmill well suited for heavy use. Have many advance features that attracts users. Can be a worthy buy. *Note: Most of the sites, stores or shopping portals listed above sell Matrix T7xe Treadmill with discounts and other exciting offers. There is a possibility that the some of above websites are not selling Matrix T7xe Treadmill now. Toughtrain.com is not liable for such cases or instances. Also we do not recommend any seller for Matrix T7xe Treadmill and a buyer should buy from where he/she gets best deal with quality of products, service and on time delivery (shipment).